Returned to Mikuni for their set lunches. The last time we went for the a la carte Japanese BBQ. It ended up around $250+++ per person (after the Feed at Raffles discount)! So when we were told that they also offer set lunches that featured some of the classic BBQ items at a much acceptable price – more economical after the Feed at Raffles discount. On offer is a special Grilled Fish set ($160+++) and a normal Grilled Fish ser ($85+++). 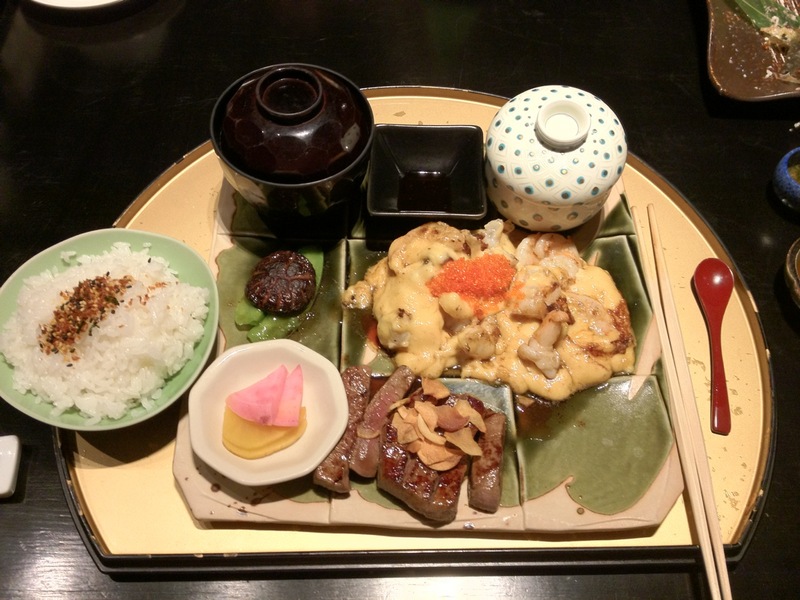 The difference – the special set offered the whole Kinki grilled at their special Yaki counter, the other was just a piece of Kinki grilled back in the kitchen. How much difference would the same piece of fish make? Actually, heaven and earth. The special featured fish from the market and grilled whole, leaving the juices and complete fish intact. I could not describe the other. Apart from that the sets come with the standard starters – a pleasant but not “Wow” salad with a tangy sesame sauce. They gave us a complimentary fish cracker – I rather they didn’t as the crackers were already soft and flat. The set lunches come with a Chawanmushi, stewed vegatable, pickles, miso soup and rice as per typical Japanese Bento configuration. My “surf-and-turf” featured the golden sauce (a Japanese mayonnaise concoction by the Teppan-chef Alex, and my favourite part of the teppan) served liberally on a teppan-grilled prawn with Australian No.5 Beef. Above-average and value for money (at $85+++, half price if you have the Feed at Raffles card and your dining party is 2 pax). The other set is the “upgraded” Kinki fish with the same bento setting. The fish was well-grilled, retained all the moisture and fish fats (omega-3 and amino acids I presumed), and justed rightly salted to taste. You can also choose to have the soy-sauce or miso variety, but that would be a complete waste of the freshness of the Kinki. 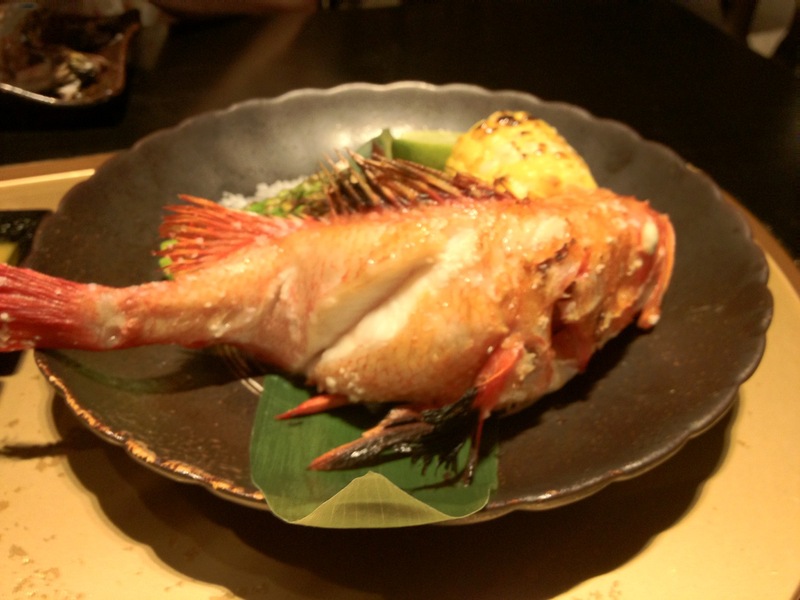 We ordered a couple of a la carte items – sashimi (fresh as usual) and the in-season Ayu Fish. 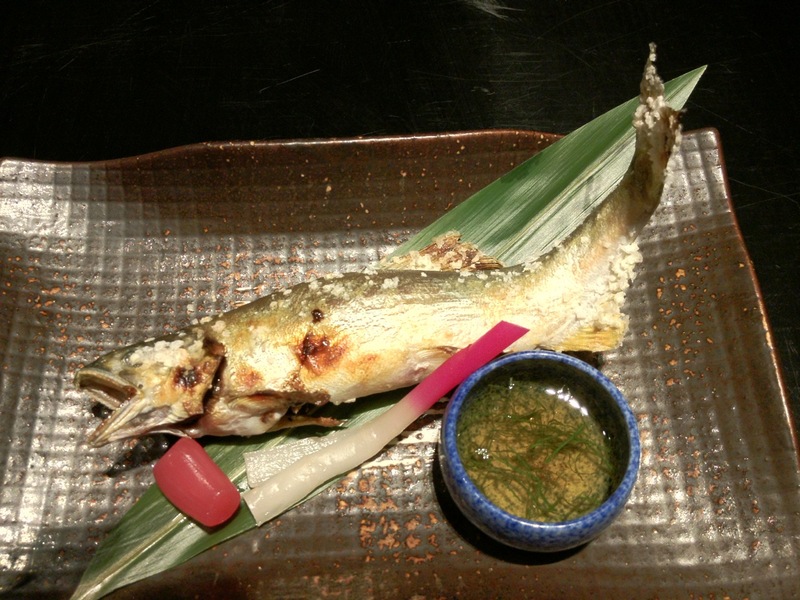 Salt-grilled Ayu is one of my favourite Japanese dish. An in-season Ayu comes with a fatty liver and roe, and just enough fats after winter perfect for grilling. I tasted the perfect one in Taipei (a close second was in Tokyo). This one was not near – Not that the fish is not fresh. The manager in Miikuni explained that the ones I had used charcoal and therefore we can get the crispiness of the skin yet moist on the flesh. Another downside of the gas-stove grill in Mikuni. The set came with desserts – a pathetic cut of melon (Australian variety not the Japanese ones), and some sweets. Services – well, a few bright sparks, generally average. Recommended only if you are Feed at Raffles member.